On behalf of the Government, the Hon. Tara Rivers, Minister of Education, Employment and Gender Affairs, has submitted a request to Her Excellency the Governor, Helen Kilpatrick, CB, to have the United Kingdom extend the Convention on the Elimination of All Forms of Discrimination against Women (CEDAW) to the Cayman Islands. Presented on the eve of Human Rights Day (December 10), the request will be forwarded by Her Excellency and reviewed by the UK Government Equalities Office. As the Minister responsible for Gender Affairs, it is fitting to take the opportunity to reaffirm the Government’s and the country’s firm stance against gender violence during the global 16 Days of Activism against Gender Violence Campaign (November 25-December 10). For the past twenty-two years, the Centre for Women’s Global Leadership (CWGL), which is dedicated to advocacy and coordination of work in support of ending violence against women at all levels, has led this global campaign. Too often we think of the males in our societies as the protectors, the providers; those who would provide safety and security. How often do we step back and truly look at the needs of boys and men when it comes to their safety and wellbeing? I would think it’s not something that we do automatically or even daily. I believe that this is the time that we must begin to look with our boys at ways of keeping them safe so that they will grow up to become role models for our future generations. For the past four months an educational campaign by the Ministry of Community Affairs, Gender and Housing has shined a spotlight on gender equality with the objective of reducing stereotypes in the Cayman Islands. 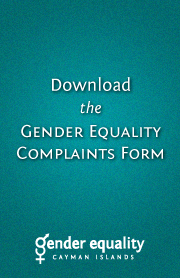 Under the theme: Make it a New Year’s Resolution: Promote Gender Equality. Don’t Stereotype, the Ministry concentrated on disparities between males and females in areas such as income, time usage, education, the work force and health. 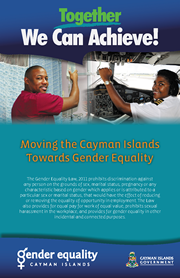 The Ministry of Community Affairs, Gender and Housing, in partnership with the Economic and Statistics Office (ESO), has been working hard to identify gender gaps in the Cayman Islands and to use this information to promote gender equality. Included among the issues that lie beneath the surface of our daily lives is the often-silent scourge of gender-based violence. This remains a significant problem affecting the Cayman Islands, as it does societies worldwide. 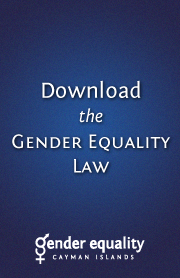 His Excellency the Governor Duncan Taylor yesterday (Monday, 10 October 2011) formally assented to the Gender Equality Bill. The groundbreaking legislation seeks to ensure equal opportunity and reward for equal effort in the workplace, as well as freedom from sexual harassment. It will become formally enshrined in local law when it is published in the Cayman Islands Gazette on Monday October 24, 2011. Proposed new legislation by the Ministry of Community, Gender Affairs and Housing (CAGH) will pave the way for the Cayman Islands to join the 187 countries around the world that have ratified the Convention for the Elimination of Discrimination Against Women (CEDAW).